This year we brought our two key staff on our Asian buying trip, Brenda Cavacciuti (our Display Specialist) and Jordan Horlin (Jewelry Room Manager). Their observations are below. A Buddha is no longer just a Buddha. After going to Bangkok and Bali this winter to join the Bakker’s on their annual buying trip, I have returned a person who appreciates the traditions of this part of the world. I feel the experience has opened my eyes to so many things. The Bakker’s work hard to buy from many different artists and businesses. It was so interesting to help and watch this process. Travelling the countryside for many hours meeting artisans in different villages, each with their own specialty products. It was a long way to travel but I appreciated the opportunity to be part of the buying team. It made me understand all the work that goes into making, buying and shipping the product. I hope to show some of that appreciation while displaying the barn this season. The Jewelry Opportunity of a Lifetime! For eight years I have worked at The Third World Bazaar overseeing the jewelry room. To say that this position is a good fit for my passion and love of silver jewelry, gem stones and anything else exotic is an understatement. This year I was fortunate enough to accompany the Bakker’s on their annual buying trip to East Asia. My mission was to scope out new jewelry and do the buying for this year’s Third World Bazaar. I’ve always understood that Bali and Thailand are highly regarded as having some of the world’s best gold and siilversmiths. The level of workmanship and pure artistry is second to none anywhere in the world. The diversity of the beautiful jewelry to be found here is so great and this is exactly what I had the pleasure to discover myself… pinch me now…..
Bangkok was our first stop and it was an explosion and feast for every sense… Life on the streets, people from every corner of the world, culture everywhere; the city is an incredible experience to discover. Being greeted with fresh juice and a cool jasmine scented face cloth inspired me on my hunt for all things jewelry. Jewelry from Thailand is well priced and provided me with a selection of great earrings and rings, bangles and bracelets…. My favorite find was the Silver Wrap. You can wear as a lovely necklace or wrap it around your wrist 4 or 5 times for a stunning silver wrap bracelet. Super fun and classy which you can wear on your wrist 24/7 and not even know it’s there. We then travelled to the tranquility of Bali, Indonesia where my search for all things jewelry continued. In Bali you are greeted with open hears, warm smiles, and a deep sense of spirituality. Their oneness of culture and everyday living was beyond inspiring. The jewelry here was a feast for my eyes. The silver work is more intricate and their use of beautiful gem stones is beyond gorgeous. I invite you to come and see for yourself the fine work that is produced by the silver artisans of Bali. Life, religion and art all converge in Bali. To experience this country was very special and I will never forget my time there. 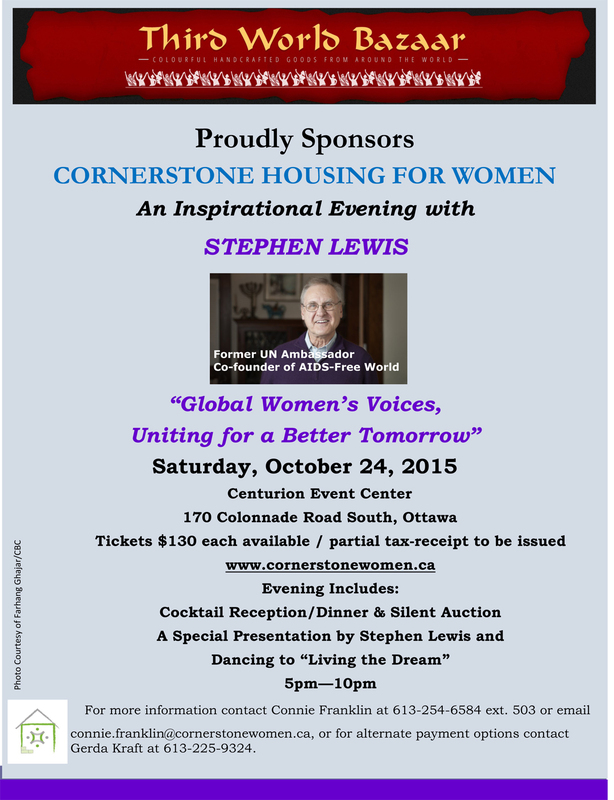 We are sponsoring this inspirational evening with Stephen Lewis on October 24, 2015. We hope you are able to come out and show your support for the Cornerstone Housing For Women Charity. For more info visit: http://ottawa.anglican.ca/cornerstone/. The Bazaar is now in mad rush to completion. Opening day, Friday October 2 is fast approaching and all hands are on deck as we prepare the displays and layout for our customers. We have new product categories from Mexico, Vietnam and Turkey that will catch peoples eye and interest. I am sitting amongst the activity of Sabana Grande’s Solar Centre, a large off-grid adobe building. Outside its open doors, looking past the glare of solar ovens, I can see La Casita Solar, an open-concept restaurant powered by biogas, solar ovens and solar panels. In between the two buildings one thousand adobe bricks dry in the sun. In a month these bricks will form a third structure for a youth centre. The Pan-American Highway roars past this rare site as green mountains roll around it. I see Latin cowboys, banana trees, and cows with huge, prehistoric horns. Walking by is a group of women with yellow and pink umbrellas for the sun. 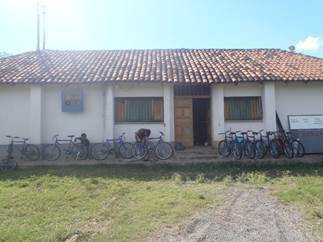 Inside this workshop, I am surrounded by five young Nicaraguans assembling nine new bicycles for rent. Between the constant slew of Nica slang (“¡si hombre!”) and the clanging of wrenches, there is being born in this village a new micro-enterprise: Bici-Futuro. My name is Jessie Lyon, and I am an intern for Falls Brook Centre’s international internship program. My placement landed me in Nicaragua’s rural north, a breezy, spacious place populated with small and strong communities. I work for Grupo Fenix, a Nicaraguan NGO supporting Sabana Grande as a solar community, and its associated organizations Las Mujeres Solares de Totogalpa, a twenty-woman cooperative, and Jovenes Pedaliando Hacia el Futuro (JHPF), a youth group. These three represent a combined, multi-generational effort for environmental awareness, environmental action through demonstration and local, self-sustainable employment for their community. 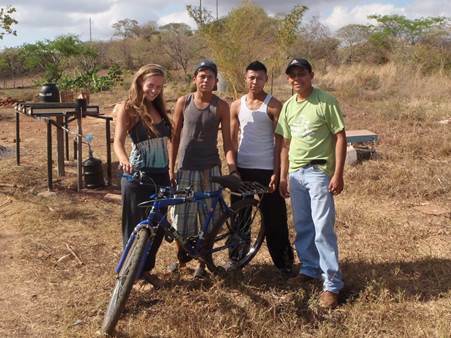 With a generous sponsorship from the Third World Bazaar, Los Jovenes and I were able to purchase bicycles and all necessary parts to start a bicycle rental company for volunteers and tourists. This place breeds ambitious and clever youth, but with no budget it is difficult for them to lead financially-productive projects. The Bazaar sponsorship ignited an interesting and trendy idea these fourteen young people are excited about, and an initiative that follows the values and interests of both JPHF and the Third World Bazaar. While it is beginning to take on a life of its own, Bici-Futuro is a valuable addition to JHPF’s sustainable, rural, community tourism project and a nation-wide push to boost Nicaragua’s tourism industry. JHPF is using these bikes and Sabana Grande’s maze of back-country trails to host educational and recreational bicycle tours. Bici-Futuro offers clients day, week or month-long rentals to explore this lush, dry tropical forest. There are hints of Canada’s expansive, thick boreal forests here, until an iguana saunters by and you realize you are far from home. This for-profit project compliments JPHF’s other projects, each with its own strategy to alleviate environmental problems. They host cultural soirees with traditional story-telling, music and dancing, and community movie screenings projected on white sheets in the Solar Center. They deliver presentations in local elementary schools. They produce and install bottle lights in darker homes. A popular focus is the ‘blender’ bikes and ‘generator’ bikes. A continual, two-year history has brought many different participants and ideas. It is such a pleasure for me to witness Los Jovenes constantly changing and adapting. They took to the bicycle rental idea immediately and, while development initiatives usually experience slow and steady progress, Bici-Futuro has grown quickly in the past month. Already this project has attracted an online journal and an American entrepreneur interested in a youth exchange. International travel is certainly rare for Nicas in this area. Hosting interviews with writers and experiencing the world of business for the first time, these young people are meeting larger ideas and bigger opportunities. It started in January 2013, when a local distributor Eduardo Diaz made the eight-hour round trip to Nicaragua’s capital Managua to purchase nine bicycles for us. JPHF member Marcel and I took a trip to the nearby city Ocotal to buy inner tubes, chain grease and all the tools necessary for repair. Currently, we are concentrating on setting prices, record-keeping, managing work hours and dealing with our first clients. With the always supportive and encouraging Cooperativa and Grupo Fenix staff, there are proposals for bike rentals being included for new volunteers and solar workshop attendees. This has become a true community-based development project. Most important, this still-new project is proving to be self-sustainable, avoiding the common development trap of dependency. 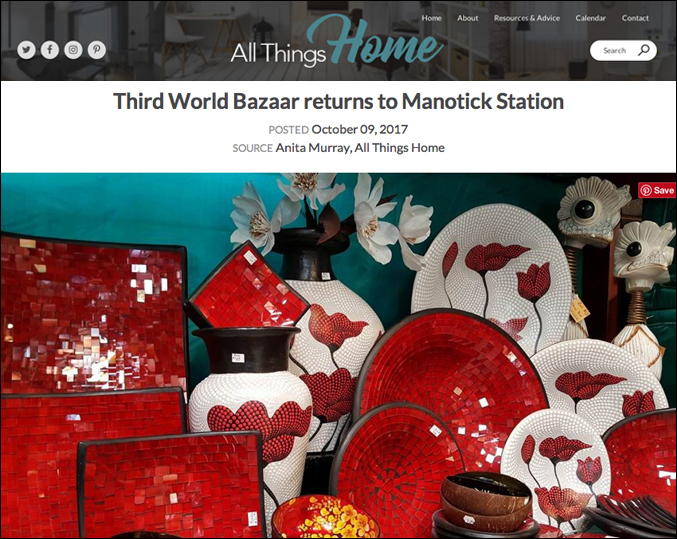 The contribution of the Third World Bazaar has created a dynamic new element to this community. Rural Nicaragua lacks employment opportunities, and though operating on a micro-level, Bici-Futuro demonstrates an example of what is possible. It offers small-time employment, but most important, it shows one way to start self-employment. Also notable is the communal nature of this new for-profit. A portion of the income is being set aside in a reserve fund for repair and maintenance while surplus profits are collected into an education account for Los Jovenes members. Approaching this community with a North American business sense, it is interesting to see my approach integrate with Nicaraguan socialist culture. During my six-month stay here, I have watched volunteers flow through the Solar Centre with different skills and focuses. I see designs for smokeless stoves, new solar ovens, additions to the restaurant’s organic garden, solar panel installations. I see solar distillers, fruit tree orchards and solar-powered battery recharger workshops. It is so fun to facilitate a contribution from a celebrated local business from my hometown to the beginning of a local business abroad. Thank you Third World Bazaar for making it possible for one small business to help another! Note for visitors to Nicaragua. There is now a new inexpensive transit option in Northern Nicaragua. If you want to see this interesting, traditional and rarely visited part of the country, connect with the Los Jovenes youth group and tour the back country on their bicycles!!! Jovenes Pedaliando Hacia el Futuro (JHPF) – Youth group running the Bici-Futuro project. Groupo Fenix – Nicaraguan NGO conducing economic and social development projects in Sabana Grande. Las Mujeres Solares de Totogalpa – Twenty-woman Cooperative conducting various solar projects in Sabana Grande . Falls Brook Centre – Canadian NGO that provided Jessie’s internship, and through which the Bazaar was able to send the money to Nicaragua for the Bici-Futuro project.